Small 4.2 litre low cost cooler bag made from 210D polyester complete with aluminium foil laminated PE foam insulation to keep the cold in. Colours: White, Yellow, Orange, Red, Bright Green, Dark Green, Light Blue, Royal Blue, Navy, Purple, Black. Dimension: H 150mm x W 200mm x 150mm (excludes handle). Print Description: 130mm x 70mm. Print Type: Screen Print. Packing: Loose packed. Large 18 litre cooler bag with PE foam insulation encased in a waterproof PEVA inner liner. The outer construction is 600D polyester with a large front pocket and two mesh side pockets. Has both carry handles and shoulder strap. Colours: Yellow/Black, Orange/Black, Red/Black, Bright Green/Black, Light Blue/Black, Royal Blue/ Black, Black. Dimension: H 320mm x W 320mm x 190mm (excludes handles and shoulder strap). Print Description: 220mm x 110mm. Print Type: Screen Print. Packing: Loose packed. Embroidery pricing valid up to end column quantity. Please contact us for quotes above this. 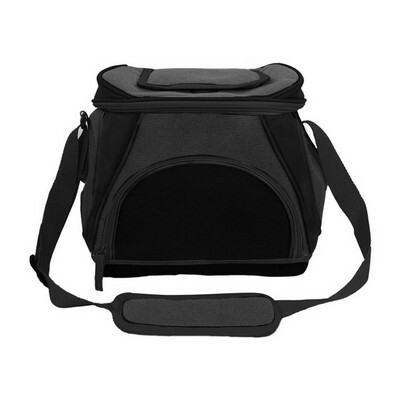 Small 3.5 litre cooler bag ideal for carrying lunch and a drink. Manufactured from 210D polyester complete with aluminium foil laminated foam insulation and an external pocket. Colours: White, Yellow, Orange, Red, Bright Green, Blue, Black. Dimension: H 240mm x W 175mm x Gusset 125mm (excludes handle). Print Description: 110mm x 100mm. Print Type: Screen Print. Packing: Loose packed. 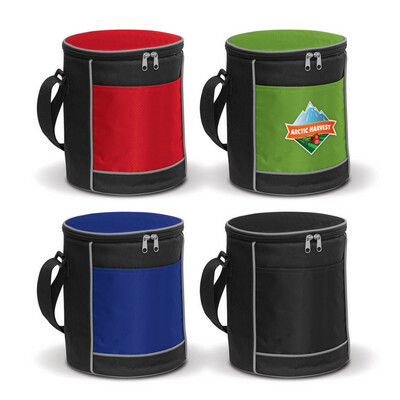 Personal three litre cooler bag which is ideal for lunches or drinks. Has a shoulder strap that can be adjusted to a convenient carry handle. Manufacturerd from 600D polyester with attractive patterned ripstop nylon accents. Features extra thick PE foam insulation encased in a waterproof PEVA inner liner. 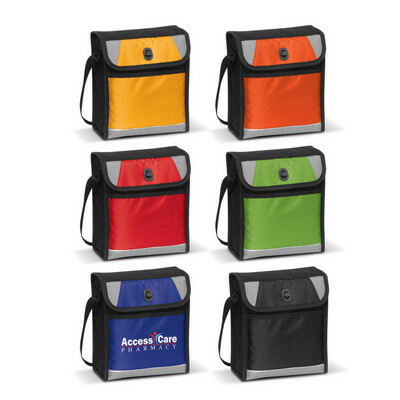 Has an outer mesh pocket, a front pocket and a secure twist lock closure. Colours: Yellow/Black, Orange/Black, Red/Black, Bright Green/Black, Blue/Black, Black. Dimension: H 235mm x W 210mm x Gusset 100mm (excludes shoulder strap). Print Description: 130mm x 75mm. Print Type: Screen Print. Packing: Loose packed. Smart 6.5 litre cooler bag manufactured from 600D polyester with an inner lining of aluminium foil laminated PE foam insulation. Other features include a carry handle, adjustable shoulder strap, three zipped external pockets and two mesh pockets. Colours: Yellow, Orange, Red, Bright Green, Teal, Light Blue, Royal Blue, Navy, Black. Dimension: H 250mm x W 260mm x Gusset 140mm (excludes handles). Print Description: 70mm x 70mm (one colour). Print Type: Screen Print. Packing: Loose packed. Embroidery pricing valid up to end column quantity. Please contact us for quotes above this. 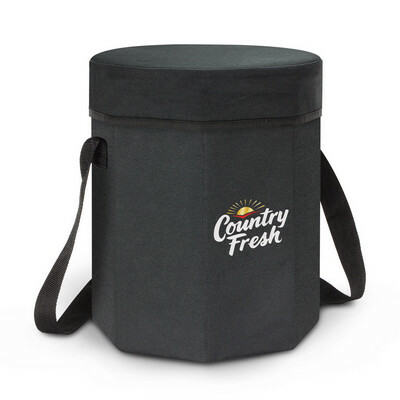 Robust 11 litre cooler bag which will hold 24 cans and doubles as a seat that can support up to 90kg. It is manufactured from 600D polyester with an inner lining of aluminium foil laminated PE foam insulation. Igloo has a unique removable base which allows it to fold flat for economical transportation as well as compact storage when not in use. It is easily assembled in a few seconds and other features include a soft padded seat, plywood reinforced walls and an adjustable shoulder strap. Colours: Black. Dimension: Dia 300mm x H 360mm (excludes handles). Print Description: Lid - 160mm x 160mm (one colour). Print Type: Screen Print. Packing: Loose packed. 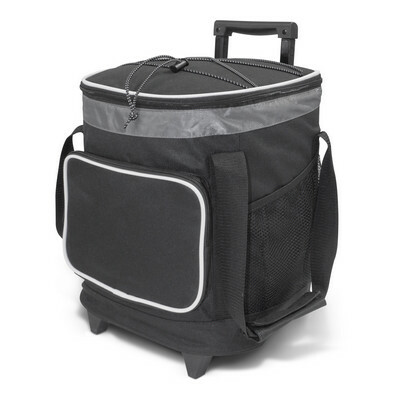 Large 16 litre trolley cooler bag with a two stage pull up handle and robust dual wheels. Glacier has PE foam insulation encased in a waterproof PEVA inner liner and the outer construction is 600D polyester with smart ripstop trim. Other features include two large side pockets, a large zippered rear pocket, woven carry handles with a Velcro wrap and smart elastic lacing which is ideal for holding a sweater or light jacket. Colours: Black/Grey. Dimension: H 410mm x W 280mm x Gusset 270mm (excluding handle and straps). Print Description: 180mm x 120mm (one colour). Print Type: Screen Print. Packing: Loose packed. 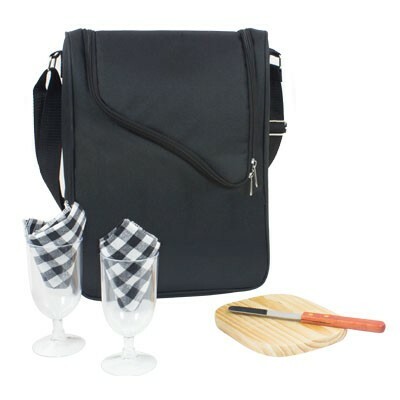 Black 600D polyester, insulated cooler includes: 2 x acrylic glasses, black and white napkins, corkscrew, cheese knife, hardwood cutting board, holds 2 bottles of wine Black 600D polyester, insulated cooler includes: 2 x acrylic glasses, black and white napkins, corkscrew, cheese knife, hardwood cutting board, holds 2 bottles of wine Size 265 x 350 x 100mm. Print: 150 x 100mm. Brand: Screen, transfer. 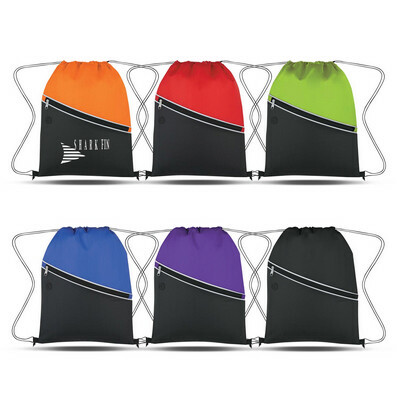 Drawstring backpack cooler bag which has PE foam insulation encased in a waterproof PEVA inner liner. The outer construction is 210D polyester. A lead time of 10-15 working days applies to this product. Colours: Red, Lime Green, Royal Blue, Black. Dimension: W 350mm x H 450mm. Print Description: 203mm x 229mm. Print Type: Screen Print. Packing: Bulk. Less than minimum quantities are not available for this item. 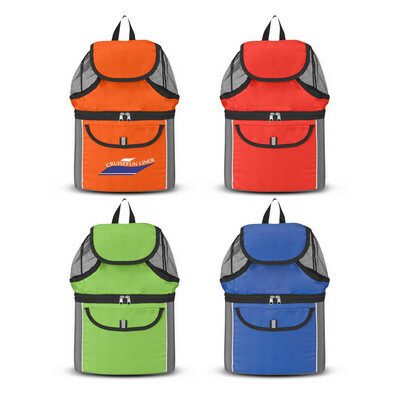 Stylish drawstring backpack cooler bag which has PE foam insulation encased in a waterproof PEVA inner liner. The outer construction is 210D polyester and it has a large zippered front pocket and a built in slot for earbuds. A lead time of 10-15 working days applies to this product. Colours: Orange, Red, Lime Green, Royal Blue, Purple, Black. Dimension: W 362mm x H 445mm. Print Description: 229mm x 127mm. Print Type: Screen Print. Packing: Bulk. Less than minimum quantities are not available for this item. 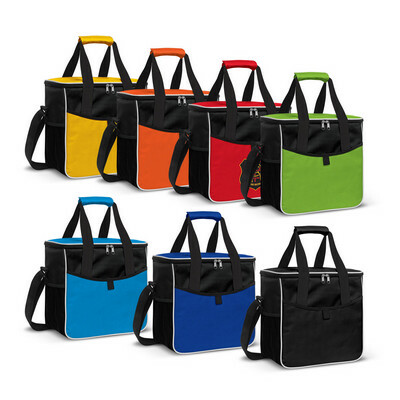 Backpack cooler bag which is manufactured from 210 polyester. 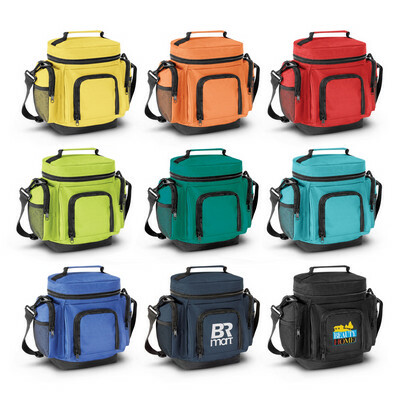 It has a double zippered lower compartment with PE foam insulation encased in a waterproof PEVA inner liner which will hold up to six beverage cans. Other features include a drawstring mesh upper compartment, a hook and loop main bag closure, a front pocket with a hook and loop closure, adjustable padded shoulder straps and a carry handle. A lead time of 10-15 working days applies to this product. Colours: Orange, Red, Lime Green, Royal Blue. Dimension: W 305mm x H 430mm x 125mm. Print Description: 152mm x 89mm. Print Type: Screen Print. Packing: Bulk. Less than minimum quantities are not available for this item. 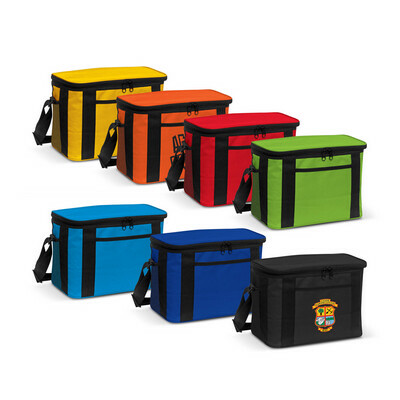 Lunch box style cooler bag which is manufactured from 600D polyester with PE foam insulation encased in a waterproof PEVA inner liner. It has a zippered main compartment, a front zippered pocket, an internal mesh pocket and a carry handle with a rubber grip. A lead time of 10-15 working days applies to this product. Colours: Grey, Orange, Fuchsia, Red, Lime Green, Light Blue. Dimension: W 260mm x H 290mm x 100mm. Print Description: 140mm x 127mm. Print Type: Screen Print. Packing: Bulk. Less than minimum quantities are not available for this item. 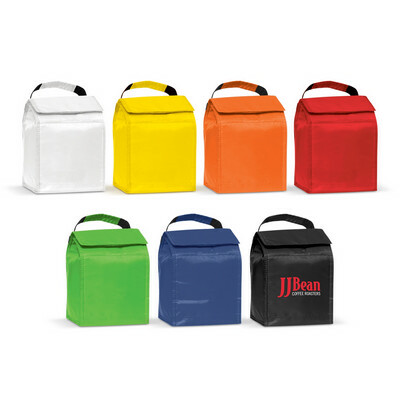 Foldaway lunch cooler bag with a carry handle which is manufactured from 210D polyester with PE foam insulation encased in a waterproof PEVA inner liner. It has a hook and loop closure, a slip pocket on the closure and an ID holder for easy identification. A lead time of 10-15 working days applies to this product. Colours: Red, Lime Green, Royal Blue, Black. Dimension: W 190mm x H 255mm x 82mm. Print Description: 102mm x 51mm. Print Type: Screen Print. Packing: Bulk. Less than minimum quantities are not available for this item. 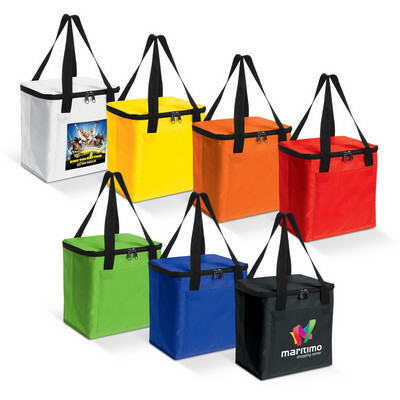 Foldaway lunch cooler bag with a carry handle which is manufactured from 80gsm non woven material with foil laminated PE foam insulation. It has a slip pocket on the closure and an ID holder for easy identification. A lead time of 10-15 working days applies to this product. Colours: Orange, Red, Lime Green, Royal Blue, Purple, Black. Dimension: W 205mm x H 150mm x 140mm. Print Description: 102mm x 76mm. Print Type: Screen Print. Packing: Bulk. Less than minimum quantities are not available for this item. Round three litre cooler bag with a shoulder strap that can be adjusted to a convenient carry handle. 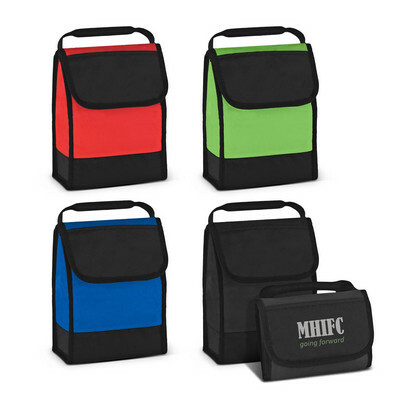 Manufactured from 600D polyester with an attractive patterned ripstop nylon lid and external pocket. Features extra thick PE foam insulation encased in a waterproof PEVA inner liner. Colours: Red/Black, Bright Green/Black, Blue/Black, Black. Dimension: Dia 215mm x H 255mm (excludes shoulder strap). Print Description: 140mm x 100mm. Print Type: Screen Print. Packing: Loose packed. Rugged medium size 10 litre cooler bag with thick PE foam insulation encased in a waterproof PEVA inner liner. The outer construction is 600D polyester with a front pocket and two mesh pockets which are ideal for holding utensils. Has an adjustable shoulder strap complete with a rubber pad. Colours: Yellow, Orange, Red, Bright Green, Light Blue, Dark Blue, Black. Dimension: H 210mm x W 320mm x Gusset 205mm (excludes shoulder strap). Print Description: 130mm x 110mm. Print Type: Screen Print. Packing: Loose packed. Embroidery pricing valid up to end column quantity. Please contact us for quotes above this. 420D Nylon/Aluminium film material for easy clean. Dual zippers (upper and lower) provide accessibility. Collapsible for easy storage Wall of cooler is designed with cubes of gel; simply freeze and go - no messy ice needed. Convenient carrying handle. Holds twelve 12 cans. Size: 240 x 260 x 140mm | Flat 340 x 240 x 30mm Colour: Black. Decoration Option: Screen Print. Decoration Area: 160 mm x 120mm. 420D Nylon/Aluminium film material for easy clean. Dual zippers (upper and lower) provide accessibility. Collapsible for easy storage Wall of cooler is designed with cubes of gel; simply freeze and go - no messy ice needed. Convenient carrying handle. Holds twelve 18 cans. Size: 240 x 270 x 260 mm | Flat 440 x 250 x 30 mm Colour: Black. Decoration Option: Screen Print. Decoration Area: 180 x 160mm. 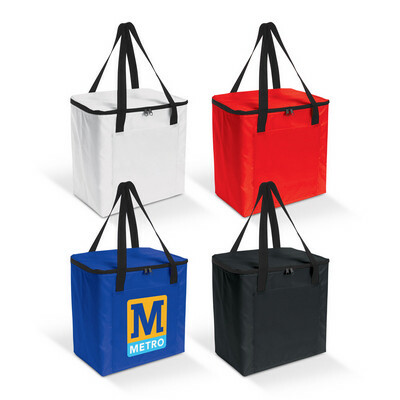 Medium six litre cooler bag with double handles made from 210D polyester complete with aluminium foil laminated PE foam insulation to keep the cold in. Colours: White, Yellow, Orange, Red, Bright Green, Blue, Black. Dimension: H 230mm x W 230mm x 170mm (excludes handles). Print Description: 140mm x 120mm. Print Type: Screen Print. Packing: Loose packed. Robust large 18 litre cooler bag made from 210D polyester complete with aluminium foil laminated PE foam insulation to keep the cold in. Has reinforced webbing handles and a large front pocket. Colours: White, Red, Blue, Black. Dimension: H 310mm x W 310mm x 200mm (excludes handles). Print Description: 180mm x 180mm. Print Type: Screen Print. Packing: Loose packed. 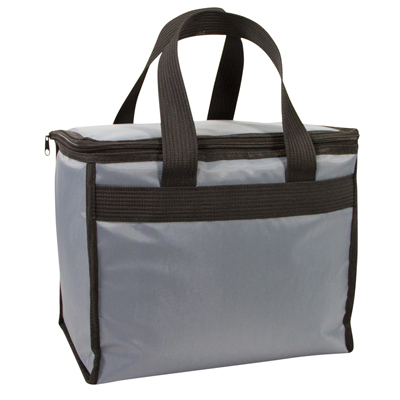 Textured PVC cooler bag with silver insulated lining and heavy duty carry handles. Compliments the expedition overnight bag and vanity bag. Size: 350 x 290 x 200mm Colour: Dark Green. Decoration Option: Screen Print. Decoration Area: 150 x 200mm. 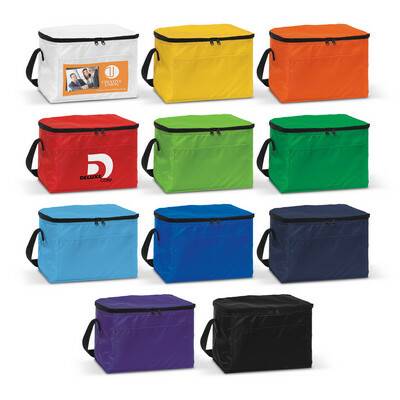 Large size 420D polyester cooler bag, with white insulated lining and heavy duty carry handles. Size: 330 x 200 x 280mm Colour: Black. Decoration Option: Screen Print | Transfer Print. Decoration Area: 250 x 150mm. Large size 420D polyester cooler bag, with white insulated lining and heavy duty carry handles. Size: 330 x 200 x 280mm Colour: Grey. Decoration Option: Screen Print | Transfer Print. Decoration Area: 250 x 150mm.